The book “Setting Aside All Authority” comprises 10 chapters, 270 pages. The last half of the book is largely made up of two appendices: (A) the first English translation of Monsignor Francesco Ingoli’s essay to Galileo (disputing the Copernican system on the eve of the Inquisition’s condemnation of it in 1616) and (B) excerpts from the Italian Jesuit astronomer Giovanni Battista Riccioli’s reports on his experiments with falling bodies. The book is published by the University of Notre Dame, 2015. Cover of the book. The cover image is taken from Riccioli’s New Almagest (1651). Note the heliocentric system (top left) compared to the Tychonic hybrid geocentric system (bottom right). 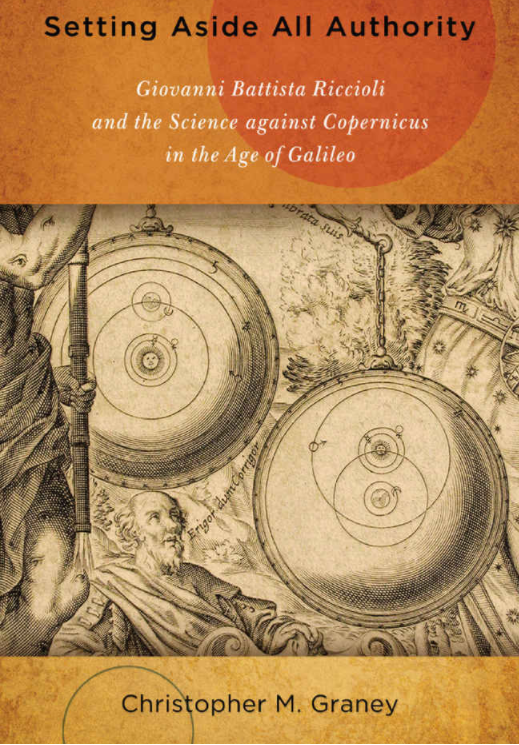 The main thesis of the book challenges the notion that around the time of Galileo, and the beginning of the Copernican revolution, opponents of the heliocentric worldview, championed by Galileo, were primarily motivated by religion or dictates from the authority of the Roman Catholic Church. The author, Christopher M. Graney, uses newly translated works by anti-Copernican writers of the time to demonstrate that they predominantly used scientific arguments and not religion in their opposition to the Copernican system. Graney argues that it was largely a science-versus-science debate, rather than church authority-versus-science as often incorrectly portrayed. In the 1651, the Jesuit Giovanni Battista Riccioli published his book the New Almagest wherein he outlined 77 arguments against the Copernican system (pro-geocentrism) and 49 arguments in favour of it. Most arguments against the Copernican heliocentric system could be answered, at that time, but Riccioli, using the then available telescopic observations of the size of stars, was able to construct a powerful scientific argument that the pro-Copernican astronomers could not answer without an appeal to the greatness of God. Graney largely uses Riccioli’s New Almagest, which argues in favour not of the Ptolemaic system but of the hybrid Tychonic system, where the Earth is immobile at the centre of the universe, the sun, the moon and the stars circle the earth; but the planets circle the sun. Riccioli built on the work of the Danish astronomer Tycho Brahe, and built a strong scientific case against the heliocentric system, at least through the middle of the seventeenth century, which was several decades after the advent of the telescope. If the earth were rotating, then a falling body should hit a point on the surface of the earth at a definite distance from a vertical line to the surface, if dropped vertically. The same argument could be made for cannon balls fired in different directions on the earth’s surface. These type of discussions and arguments carried on for a century, and even Isaac Newton got involved. What we now know as the Coriolis force, a ‘fictitious’ force, resulting from the rotation of the planet on the fired or dropped objects could not be measured with the required precision in the 17th century. Riccioli carried out many precise ball dropping experiments. He intended to show that there was no deviation in the path of the falling bodies but he failed to get any conclusive result (due to many unknown and uncorrected errors). Also he had argued that experts firing cannon balls would have to correct for earth rotation (if the earth did rotate). However, it was found that the ‘experts’ were nowhere that good, they did not have that sort of precision or accuracy, and so that also was an inconclusive argument. We know today that the rotation of the earth has to be taken into account for long-range military targeting of projectiles (due to the Coriolis force). Even highly accurate snipers firing over 1000 m are required to account for not only wind direction, wind speed, air density, elevation, but also the Coriolis effect due to the rotation of the earth. In 1851, two hundred years after Riccioli’s publication of the New Almagest, Léon Foucault first demonstrated his pendulum in Paris. It was the first accurate demonstration of the effect of Earth rotation on falling bodies. The pendulum (Fig. 1) swings with a regular period and as the earth rotates the path of the pendulum successively moves to the left (as viewed from above) tracing out a circle. This is the effect of the Coriolis force. It is proof of the rotation of the planet. Interestingly, the argument used by Galileo and other pro-Copernicans was that no effect on falling bodies could be detected due to common motion. Galileo used an analogy about an insect flying inside of a moving ship at sea. 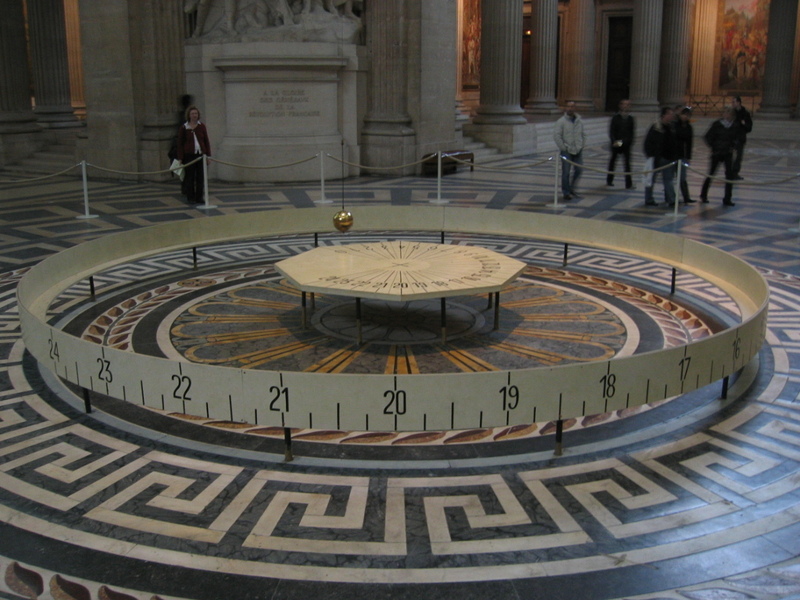 But Foucault’s pendulum proves that analogy to be invalid. The size of stars argument went as follows. Sizes of stars were first measured by eye, before the invention of the telescope. That is what Tycho Brahe spent much of his time doing. That gave a ‘magnitude’ for a star, catalogued as magnitudes 1 through 6, with 1 the largest and 6 the smallest. Of course, large meant bright and small meant dim. It was based on these ‘measured’ sizes of stars that Tycho Brahe developed an argument against Copernicus. Then with the invention of the telescope, it was observed that the star sizes were at least 10 times smaller. But because the astronomers also observed solid disks for the planets out to Saturn (and even phases for Venus) it was then believed that the telescope gave the true sizes of the stars also. Based on telescopic measurements of the star sizes, Riccioli formulated a version of the Brahe argument against the heliocentric system and in favour of the geocentric Tychonic system. With the telescope, astronomers looked for parallax of the distant stars but were not able to detect any parallax. In the geocentric universe the earth is immobile and hence no parallax would be expected. In the heliocentric universe, the earth orbits the sun once per year, and in so doing, over a 6 month period it moves from one side of its orbit to the other. Therefore based on trigonometry, a foreground star should be seen to move against the more distant background stars as the earth moves between these two extrema. But of course the orbit is circular. Therefore if a star is close enough it should trace out a circle on the sky as seen from earth over a solar year. Thus the argument followed: if a star was seen to have a certain size but it was too distant to exhibit any parallax, then it must be massively large, at least as large as the orbit of the earth around the sun. It was argued that that must be the case, otherwise no disk for the star could be observed. The only response the Copernican astronomers had to that was that God is a great God and He made such large stars for His own glory. Riccioli argued that it was not the geocentrists who appealed to authority but the heliocentrists, in their answer to the ‘size of stars’ argument—purely a scientific argument based on the best science of their day. Ironically, the geocentrists may not have made their own error (assuming that their telescopes gave the correct size of stellar disks) had they been privy to the English astronomer Horrocks’ report on the 1639 transit of Venus across the sun. During his observations, Horrocks noted that he observed the moon passing through the stars of the constellation Pleiades. As the leading dark edge of the moon passed in front of the stars they simply winked out. They vanished suddenly, meaning they did not transition to darkness as you might expect if their disk was being slowly covered by the dark edge of the moon. This meant that the ‘measured’ size of the stellar disks was in fact spurious—due to an unknown cause at that time. The sizes of the planets was correct because the telescope resolution was sufficient but it was not sufficient for distant stars. But Horrocks’ report was not published until 1662, 11 years after Riccioli published his New Almagest. And in 1659 Christian Huygens published his observations of stars using filtering (with smoked glass) wherein he showed the star sizes changed with greater filtering. Thus it was soon realised that stars were actually point objects. In 1665 Riccioli published his Reformed Astronomy, in which he maintained his table of star sizes but de-emphasized the star-size argument. Of course, if the stars are so enormously distant and if their ‘measured’ sizes are spurious, then the major scientific argument the geocentrists had against the heliocentrists evaporates. By 1720 Edmund Halley argued that the star sizes were spurious, but some astronomers still maintained the argument. A century later the English astronomer George Airy developed a full theoretical explanation for the spurious disk of stars. It explained both the appearance of disks and why they varied in size for different stars. 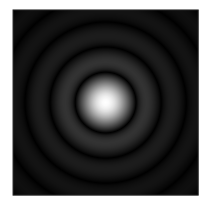 This effect is known as an ‘Airy Disk’ and results from diffraction effects in the objective lens of the telescope. Because light has a wave nature adjacent beams interfere with each other creating a pattern of maxima and minima. Since the lens is circular it produces a central bright maximum surrounded by ever reducing surrounding rings. See Fig. 2. The same effect would be observed with the human eye (i.e. a lens) or a pin hole (i.e. no lens). Thus Graney argues that it was not until the mid-nineteenth century before complete arguments supporting the Copernican system were developed for Riccioli’s arguments. The main two arguments were the size of stars, explained by their spurious observed disks, and the lack of precision of falling body experiments, after which it was shown via the Foucault pendulum that the earth does in fact move, rotating on its axis. Thus Graney argues that the old canard that astronomers of the seventeenth century held onto religion and authority as their argument against Galileo and the Copernican system is wrong. It was science against science and not science against religion per se. Both sides at times used religion but the ‘battle’ was primarily fought with science.